Is It OK to Use Marijuana During Pregnancy? Image: Michael Burrel/GUSTOIMAGES/SCIENCE PHOTO LIBRARY/Getty Images. Design: Ashley Britton/SheKnows. Currently, 31 states and the District of Columbia have legalized marijuana in some form — some for medical use and others for recreational use too. But despite a 2017 report from the Society for the Study of Addiction and published in the journal Addiction, which claims that marijuana is less damaging than alcohol, marijuana use remains taboo in many circles, and using cannabis during pregnancy is largely frowned upon. Despite the social stigma, many expectant moms are using marijuana. A January 2017 study published in JAMA reveals that marijuana use among pregnant women increased by 62 percent from 2002 through 2014, and the figures could be much higher — it’s hard to know exactly how many women take the drug during pregnancy because many are hesitant to admit it. According to the National Institute on Drug Abuse, some pregnant women use cannabis to treat extreme nausea. Other pregnant women may use pot to relieve other pregnancy symptoms, such as vomiting, anxiety, sleep disturbances and chronic pain. The position of the National Institute on Drug Abuse is clear: it states that there's no research to show that using marijuana during pregnancy is safe and says the majority of doctors won't recommend it. However, there is anecdotal evidence out there showing that marijuana may be an effective alternative remedy for pregnancy symptoms. For example, a small Canadian study published in the journal Complementary Therapies in Clinical Practice in 2006 found that 92 percent of pregnant women who used marijuana to treat morning sickness found it to be effective. While your doctor or midwife may be unlikely to prescribe cannabis during pregnancy, you might be able to get it from your local dispensary. A study published in the journal Obstetrics & Gynecology in June 2018 found that 69 percent of Colorado dispensaries recommended using cannabis to treat morning sickness, and 36 percent said it was safe during pregnancy. This study is of particular concern to reproductive and perinatal psychiatrist Dr. Carly Snyder. 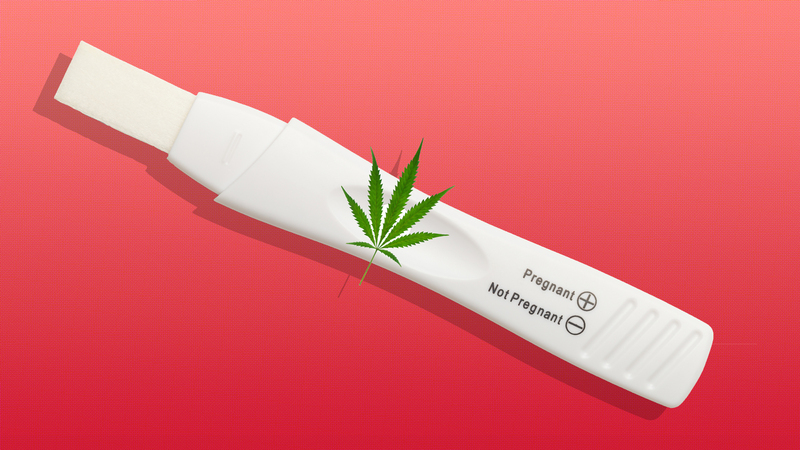 "There are no studies indicating that marijuana is effective for nausea and vomiting during pregnancy," she tells SheKnows. "On the other hand, there are studies that indicate potential risk from fetal exposure to cannabinoids." One of the most recent studies of marijuana use during pregnancy, published in the journal Obstetrics & Gynecology in October 2018, states that cannabis is not safe during pregnancy, gynecologist and female pelvic medicine and reconstructive surgeon Dr. Anat Zelmanovich tells SheKnows. "The THC [tetrahydrocannabinol, the primary psychoactive component of marijuana] can be passed through the placenta and theoretically affect the growing fetal brain," says Zelmanovich. "I would strongly recommend women do not smoke anything, including marijuana, during their pregnancies." In response to the recent widespread legalization of marijuana in several states, the American College of Obstetrics and Gynecology issued a statement urging OB-GYNs to educate patients and dissuade them from using cannabis in pregnancy. "There are many well-researched treatment options for pregnancy-related mental and physical health concerns where benefit outweighs risk, such as using SSRIs to treat moderate to severe depression, but this cannot be said for marijuana use in pregnancy," says Snyder. When it comes to those risks, studies suggest cannabinoids may impair fertility and increase the risk of ectopic pregnancy and miscarriage. "Cannabinoids may also negatively impact embryo development and lead to an increased risk of poor growth, neural tube defects and other birth defects, preterm delivery, stillbirth, neurodevelopmental issues and learning disabilities," says Snyder. For example, a study published in March 2017 in the Journal of Biosocial Science analyzed data from perinatal and neonatal databases at Ontario's London Health Sciences Centre and found that women who used marijuana while pregnant were almost three times more likely to have an infant with low birth weight than women who did not use marijuana. However, data is limited and often fails to separate cannabis use and alcohol or tobacco consumption, which makes it identify the effects of the different substances and results in conflicting or inconclusive findings. It should also be noted that the absence of studies supporting the use of marijuana for medicinal purposes (whether during pregnancy or not) is partly due to Food and Drug Administration and National Institute on Drug Abuse restrictions on large-number randomized controlled trials on humans. When it comes to marijuana research, Canada is leading the way. In January 2018, the Canadian federal government announced $1.4 million in funding for marijuana research, noting the effects of use during pregnancy as a priority area. Ultimately, pregnant women should consider all the research in order to make an informed decision about using marijuana during pregnancy and seek advice from their health care provider.